Your credit score – that little three-digit number that controls your financial life – can be incredibly frustrating. You could be paying all of your bills on time only to find your credit score hasn’t gone up. You feel that you are doing everything right but you’re not seeing any improvement in your credit score. Why is this the case? You’re not going to like this answer but it’s … it all depends. 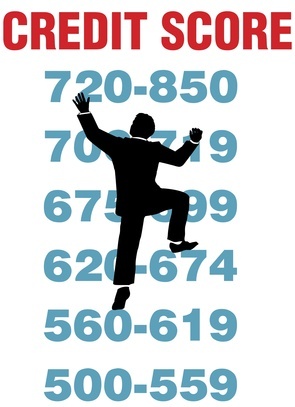 The way credit scores are calculated is based on complicated formulas. In addition, this may surprise you but there are literally dozens of different formulas used in credit scoring and it’s impossible to keep track of all of them. But here’s the really important part. Your credit history is unique. No credit expert can tell you why your score isn’t improving without actually looking at your credit report. You have seen your credit reports recently, right? The first step in trying to determine why your credit score isn’t getting any better is to review your credit reports. You have seen your reports recently, right? If not, you need to get them from the three credit-reporting bureaus – Experian, Equifax and TransUnion. By law, they are required to give you a free copy of your report once a year. Or you can go to the website www.annualcreditreport.com and get all three of them simultaneously. While it’s impossible to say exactly why your credit score has stayed stagnant there are four things in general that could be causing this. The first is that your credit card balances may be too high. A full 30% of your credit score is based on your credit utilization or how much of your total credit limits you’ve used up. You can check yours by dividing the total amount of your credit limits into the amount you’ve used. A simple example of this would be if you had $10,000 in total credit limits available but had charged up $3000, your credit utilization would be 30%, which is considered acceptable. If you do the math and find that your credit utilization is higher than 30%, this is what may be keeping your credit score stagnant. If it turns out that you do have a high credit utilization ratio, then paying down some of that debt could improve your credit score. If you’re paying your bills on time and you have a low credit utilization ratio, then there may be some serious negative thing in your history like a foreclosure or bankruptcy. If this is the case, it will take many years for your credit score to recover. In fact, information like this will remain in your credit reports for seven years. The impact it has on your credit score will lessen as the years go by but there’s nothing that you can do about this yourself. The best thing you can do is concentrate on those things you can control such as making your payments on time and keeping your credit utilization below 30%. The most important component of your credit score is your credit history or how you’ve used credit in the past. It makes up 35% of your credit score. The second most important component is the one you’ve already read – your credit utilization. But beyond these two there are a number of other factors that could be causing your credit score to stagnate. This includes how many times you’ve applied for new credit, how long you’ve had credit and the mix of accounts in your credit file or how many different types of credit you have. How long you’ve had credit is important but it’s not something that you can change. Theoretically speaking, the longer that you’ve had credit the better your score should be. Hint: even if you have an old credit card you’re no longer using, don’t close it. The reason for this is because the age of your credit is an average of the ages of all of your accounts. If you have a credit card, you opened five years ago and one you opened two years ago the average age of your accounts would be 3 1/2 years. If you close that five-year old credit card, the average age of your accounts would drop to two years. The reason why the mix of your accounts is important is because if you have several different types of installment and revolving accounts and maybe an automobile loan, this shows that you’ve been responsibly managing different kinds of credit. Assuming you now have your credit reports and we certainly hope you do, you need to then review them very carefully looking for errors that could be keeping your credit score lower than it really should be. These errors could be anything as small as your name misspelled or as big as Identity theft. If you do find errors that are serious enough you believe they’re having a negative effect on your credit score, you need to dispute them. The way you do this is by writing a dispute letter to the appropriate credit reporting agency. You will need to send it via certified mail so you’ll know it was received. You will also need to include copies of whatever documentation you have to support your dispute. Be sure to send copies and not the originals. And the more evidence you can provide that the information is in error, the more likely it is that the credit bureau will remove the item from your file. Once the credit bureau receives your letter it will contact whatever entity reported the information and ask it to verify it. If that organization can’t verify the information or if the credit bureau does not get back to you within 30 days, the erroneous information must be deleted from your credit file.